It appears once in a while, ok, I’m telling fibs, maybe more than that, such a jolly good idea as to make life much easier. On the same level as quantum theory and pull top tab tins, and other things which you just simply fall in love with it and have to have it. What a m I referring too?? A supercalifragilisticexpialidociousness of a handy aid for conquering the Ramp of Doom!!!! Believe me, we all need a hand with that monster, from time to time. Who would have thought? The ingenious pleasure of a simple wheel or washer located in such a strategic position. 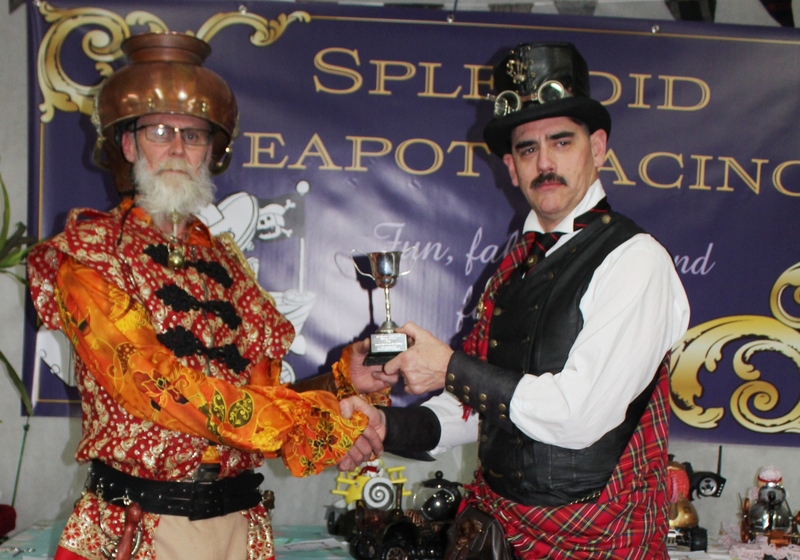 I really want to thank Stephen for this aid and his championing of Splendid Teapot Racing and his recent success at the International Steampunk Symposium in Cincinnati. This culminated in him knocking out the course in 24 seconds. Wow!!!!! Impressive. So a giant thank you to Stephen. Huzzah! I will let the videos tell the successful tale. You can find them on Stephen’s page and here . Enjoy.